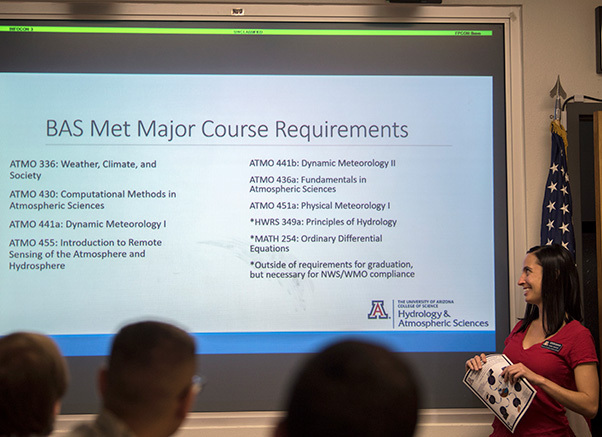 Dr. Martha Whitaker, University of Arizona Professor of Hydrology, goes over an online atmospheric science bachelor degree program to members of the 25th Operational Weather Squadron at Davis-Monthan Air Force Base, Ariz., June 16, 2018. The program is tailored specifically for active duty Airmen interested in pursuing an advanced degree in meteorology. The program is fully online and offers flexibility for shift workers as well as PCS considerations. Members from University of Arizona visited the 25th Operational Weather Squadron at Davis-Monthan Air Force Base, Ariz., to highlight a new online degree program geared for active duty Airmen in the weather career field. The atmospheric science bachelor degree program is tailored specifically for active duty Airmen interested in pursuing an advanced degree in meteorology because it is fully online and offers flexibility for shift workers as well as PCS considerations. Additionally, the degree program accepts transfer credits from the community college of the Air Force meteorology degree. 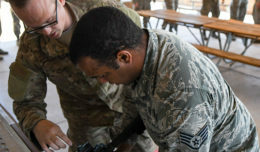 While is an intense two and a half year degree program that can be difficult to complete, active duty Airmen possess a special skillset that makes it possible. 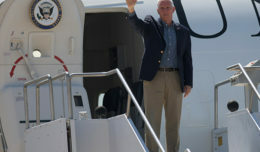 “Leadership, maturity, responsibility and organizational skills; it comes through very obviously in our students that are members of the military,” said Brittany Ciancarelli, department program manager. Brittany Ciancarelli, University of Arizona program manager, goes over an online atmospheric science bachelor degree program to members of the 25th Operational Weather Squadron at Davis-Monthan Air Force Base, Ariz., June 16, 2018. The program is tailored specifically for active duty Airmen interested in pursuing an advanced degree in meteorology. The program is fully online and offers flexibility for shift workers as well as permanent change of station considerations. According to professors and administrative staff, active duty students and veterans have a higher success rate in the degree program. 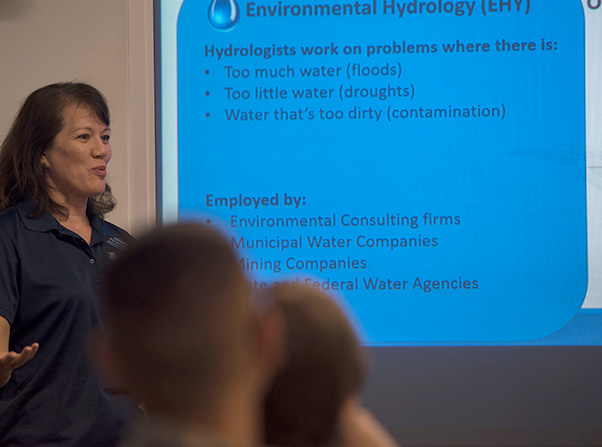 “The discipline associated with being in the military translates really well into higher education,’ said Dr. Martha Whitaker, Professor of Hydrology. Past graduates of the degree program have gone on to great success; from commissioning into the Air Force as a weather officer, to working for the national weather service and even being accepted into prestigious graduate degree programs to take their education to an even higher level.